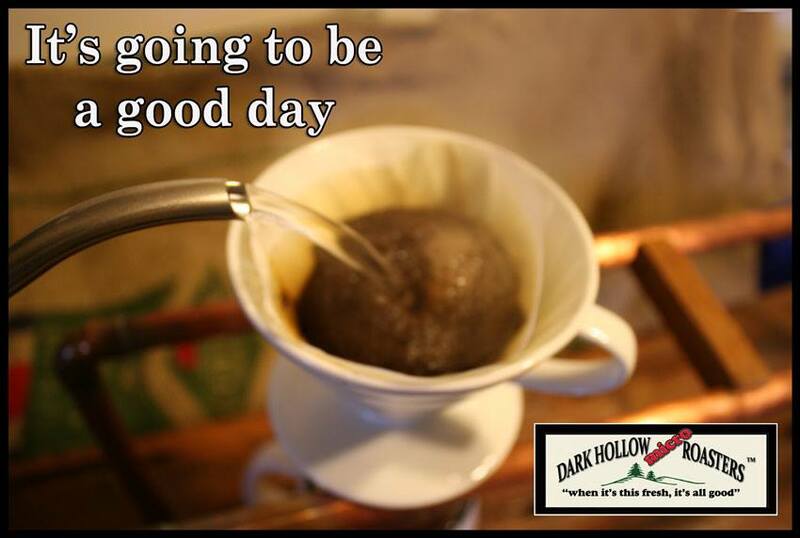 "when it's this fresh, it's all good"
Why Dark Hollow For Wholesale? Wholesale Proprietary Blends – what’s our deal? We’ve been talking about pour-overs a lot lately, and right here we’re going to do it some more. How do you know the right quantity of beans to a cup, brewing time and all that other stuff? #1 You don’t need expensive equipment. We’ve seen some beautiful pour-over cones in a variety of materials from porcelain (about $18 each) to stainless steel (about $85). And while they can make a nice presentation, I would only buy them if I had a restaurant or café where that is important. The most basic plastic cone (about $7 for a #4) makes equally incredible coffee and is virtually indestructible. One recommendation we do make is to get the larger #4 cone because with it you can either make one or two cups. With the smaller #2 you can only make one. We’re going to say seven minutes, tops. And about 3 or 4 minutes of that is heating your water. It doesn’t matter what you heat it with, just get it to boiling then turn off the heat. You can do your pour right away. Go do something else while your water is heating to a boil (about 3 ½ minutes for a 12 oz cup). And if you don’t get back to the microwave or electric kettle the second it dings, its not a problem. Studies show that your water will hold a very acceptable brewing temperature for up to about five minutes. #4 Super precise measurement is not the secret of a great pour-over, as some would have you believe. Yes, of course, within reason, and weighing has it’s place when you’re trying to calibrate your brew, but you shouldn’t have to do that every time. Here’s what we do. Grab a handful of beans, throw them in the grinder and make your coffee. The average hand holds between .3 and .5 ounces of coffee, which is a very respectable range for a good 8 ounce cup. The point is, just get started with whatever is a medium handful for you, and if your cup wasn’t strong enough, then go for a bigger handful next time. After a very short period, you will know about how big a handful you need for your preference, and you can just cut that weighing stuff right out. And it looks badass when you do it too. When your water is ready it’s time to pour. Standard disclaimer – its hot water. Pour about 1/3 of your hot water into the cone, always trying to hit any dry spots of grounds around the edges or anywhere. The key is to try to get total involvement of the water with the grounds, but you don’t have to do this drip by drip. Just pour in gently. You’ll get the “bloom” and then the water level in the cone will go down pretty fast, so you can pour in the second third of your water after just a few seconds. After about another 30 seconds or so, pour in the last part. If the last of your pour is draining out at about the three or four minute mark, you are golden. Total elapsed time is about 5 to 6 minutes, and most of that is the water heating. And if you’re using a #4 cone, you can have two wonderful cups of coffee for the same amount of time as one – just double the coffee and water. You’re going to have a beautiful cup of coffee. It will taste more robust, with more flavor and character than anything a home or commercial brewer can make. If your first cups taste too strong, you can always cut the brew in your cup with a little hot water, and that will balance it right out. This is the real point. Learn to adjust coffee for your tastes. Experiment with quantities until you are getting what you want, and then incorporate that into your routine. You’ll never go back to boring coffee (and your friends will be amazed by your coffee powers)! If you have any comments or questions, we’ll try to answer them in the comments section. The coffee traveler: Trailside / Road Warrior brewing kit. Decaffeinated coffee – How the heck does that work? A cup of coffee fosters human kindness – who knew? That’s going to leave a mark! (the 2014 Lambstock experience).